I ship everyday of the week USPS priority or parcel post so please check the listing for which shipping method. If you need something shipped to you overnight I will do that just let me know in advance I'll even gift wrap it for you if it is a present. Email me ahead of time and I will included the overnight fee in the invoice. All items for sale are final. However, if you purchased a brand new purse with tags still on it we will accept the return within 7 days of receipt of receiving your item. The item shall be returned with the original tags still attached. We are a small Designer Handbag and Clothing store.?? We specialize in Kathy Van Zeeland, Guess, Vera Bradley, Nine West, Juicy Couture, XOXO, Marc Ecko, Brighton, Victoria's Secret, Sky Brand Tops, and many more.?? Some times I'll even throw in some unusual items I find here and there. All items are authentic merchandise.?? If there is a particular purse out there and you can't seem to find it email us and we will be happy to try and find it for you at the lowest possible price and best condition.?? My personal motto is "I won't sell and wear something that I wouldn't buy and own myself".? ?I have item auctions as well as I just for purchase. Happy Bidding and Happy Buying!! 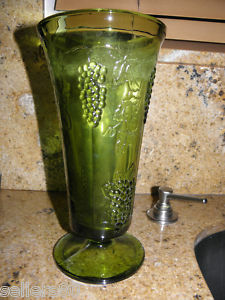 You are bidding on a beautiful Green Depression Vase Glass vase with grapes and vines on it. This vase is approx. 9 3/4" tall and 5" wide. Has no chips or cracks. It is in excellent condition with no cracks or chips at all. It is gorgeous!! 00179 Seller assumes all responsibility for this listing.